COLUMBIA, Mo. – Since 2008, MU has filed 278 U.S. patents and signed 204 options and licenses for new technologies developed at the university. As a result, companies that have licensed products invented by MU scientists have received about $1 billion in sales revenues. University officials also have created resources to support and encourage entrepreneurial students. Now, the University of Missouri has been designated by the Association of Public Land-grant Universities (APLU) as an Innovation and Economic Prosperity University (IEP) recognizing MU for its successes in innovation and entrepreneurship, technology transfer, talent and workforce development, and community development. 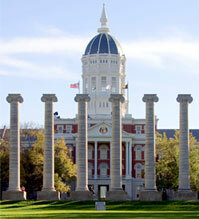 MU was one of 16 public institutions to receive this designation. MU is natural hub for innovation, as it is one of the few universities in the nation with a hospital, a veterinary hospital, a law school, a College of Engineering, and a business school on one campus. MU has had successes with economic development and prosperity through the coordinated efforts of the offices of Economic Development, Technology Management and Industry Relations, the Mizzou Advantage initiative, and MU Biodesign and Innovation Program (MUBIP). A key mission of Mizzou Advantage is to bring together faculty from different disciplines across campus to collaborate and innovate. Mizzou Advantage has proven its ability to mutually engage with private sector companies as more university researchers have commercialized their intellectual property, resulting in more jobs for the community. MUBIP was created to improve patient care through invention development of new medical technologies. Approximately two years ago, Collaboration, Leadership and Innovation for Missouri Business (CLIMB) was created to facilitate the formation of commercialization teams to move innovative business ideas forward. These organizations empower students, faculty and community members to become agents of innovation and economic growth through entrepreneurial opportunities. This award also challenges MU to build on its strengths and identify areas for continuous improvement. Fu-Hung Hsieh, a professor of biological engineering and food science, along with Harold Huff, a senior research associate, developed a low-cost soy substitute for chicken. Hsieh collaborated with Ethan Brown, CEO of Savage River Inc. for several years before Brown launched a food production facility in Columbia for the “Beyond Meat” brand. The facility utilizes technology licensed from MU, and the company expects to employ more than 60 people within five years. “The success of this product, which was developed in the laboratory, has now come full circle with the announcement that Beyond Meat has opened a plant right here in our community. It is anticipated that more than 60 jobs will be created and millions of dollars will be pumped into Columbia’s and the state’s economy,” Duncan said. EternoGen, a startup venture of MUBIP, was founded based on the discovery of collagen soft-tissue filler that does not decompose as easily as fillers on the market currently. EternoGen was the first start-up company to receive competitive funding from the UM System’s Enterprise Investment Program and additional investments have allowed EternoGen to enter the commercialization phase. Receiving additional investments allows EternoGen to open an office of operations in St. Louis and a commercialization office in Stockholm, Sweden.